After moving into a new house recently, it’s become apparent to me more so than ever that filling a house with just the ‘big stuff’, like sofas, chairs and tables, can only get your so far, and even though your house might be full there’s still something missing. For me, in order for a house to truly feel like a home, smaller items, the accessories, must play a prominent part to turning a blank space into one filled with life, soul and character. I’ve pulled together some thoughts to give you (and me!) an idea of how best to give your home that stamp of personality. Small decorative items and ornaments are great way to show of your style, as well as your memories and souvenirs, and although some people may start to get that hoarder’s grimace on their face, the idea of small items equalling clutter can be avoided as long as you find a good place to store and display them. I love this way of displaying small trinkets and treasures collected over the years. We have a lovely one in my family home, full of pebbles, stones, feathers, things we collected as children which my mother kept. Left to their own devices they might look rather like a mess, but placed together in this museum display case sort of way, they begin to tell a story, making them all rather sweet. Though the actual objects are something you’ll need to find on your own, there are plenty of printer trays available from places like Etsy, ready to house your collection. I love the idea of displaying items in irregular places, especially if something can be hung on the wall instead of occupying that ever valuable surface space; this is also a great way to not only create a feature in a room, but to avoid a sense of clutter! This decorative weave baskets and plates are a lovely bohemian style, whether you’ve picked them up in a foreign land, or seen one you loved in a store, they’re beautiful and handy! I love this simple design from Porcupine Rocks, it’ll look great with some smaller more colourful ones surrounding it. 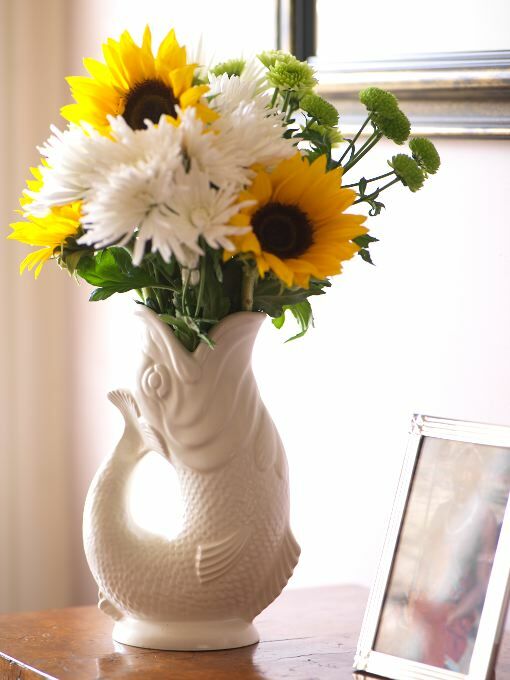 Both real and artificial flowers and plants are a must-have in a home for me. A bunch of brightly coloured sunflowers will instantly give a room a bit of life, and some elegant hydrangeas can be the perfect accessory for a sideboard or end table. Adding plants or flowers to a room will make the room feel bright, and can create an interesting feature, or an accent of colour in the room. For some of the best faux flowers around, Funky Bunch has a beautiful selection of florals so that you can make your own beautiful arrangement. Cushions are one of the easiest way to add some detailing to a room. Whether you want to insert colour or texture, or both, cushions can instantly add some fun to a room. 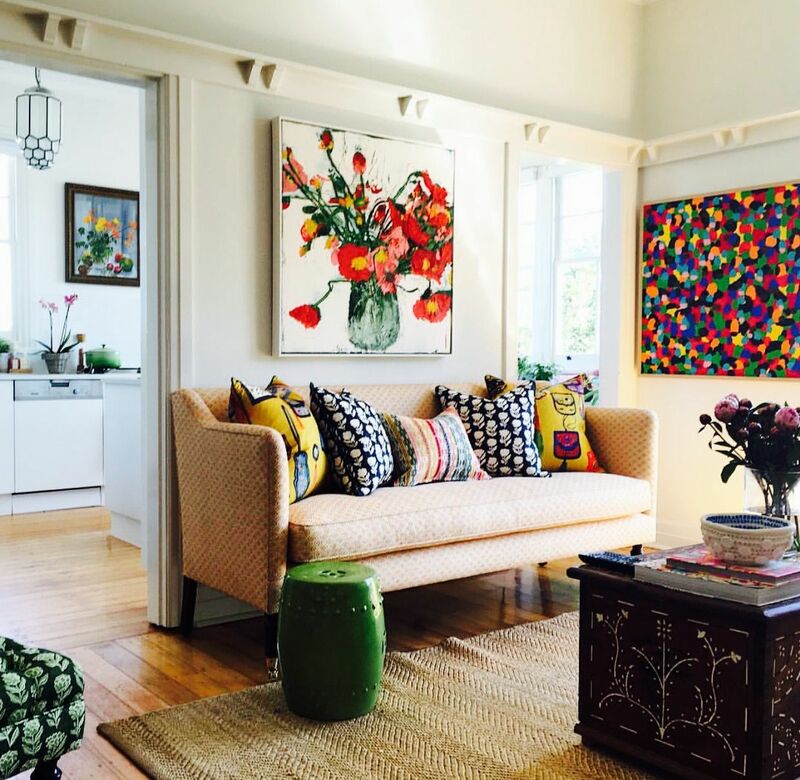 These brightly coloured cushion dress up a formal sofa, drawing attention to the space, and at the same time picking up on the surrounding area’s colours. For an interesting addition to a sofa or armchair this quirky design from Graham & Green will really spice things up. An interesting and stylish lampshade will help bring some intrigue to a room, as with all lighting, you can use lampshades to get creative and think outside the box. I really like how these wire lampshades take a traditional shade and turn it into something rather contemporary; a fun way to create a feature in a bedroom. You can change a room’s whole theme with a quick swap of the pendant shade. This wire number from Trouva is full of colour and fun; a lovely way to spruce up a playroom or kitchen. Coasters aren’t just a useful way to protect a beloved table, but they’re also a nice way to add accents of colour or a hint of pattern to a room without going over the top. These wooden coasters give off a lovely rustic feeling, and with each one sporting a different flower they have their own personalities. If you like the idea of a wooden coaster but want to add a hint of glamour into the mix, these petrified wood coasters from Curiosity Home are stunning. While large mirrors are obviously useful to have in the home, and can be oh so pretty too, smaller mirrors are great for grouping together and making a beautiful feature wall. Compiling a whole range of styles and shapes are really create an enchanted feeling. I love how this bathroom has a sweet ornate large mirror in the centre, which is then decorated by an array of smaller, intricate mirrors as well. There are really so many styles you can opt for when it comes to collecting a range of small mirrors for a display, I love the idea of using a convex mirror as well, like this little one from Rockett St George. From little projects, to treasured memories and adorable buys, finding the small things that make your house feel complete are the items that you’ll end up loving the most, as though they may be little, they’ll have the biggest impact.